my name is Stephanie. I am a graduate from University of Illinois, and am a full-time mother to three young children. I have my CFL 1, CFL2, and CF KettYou can join me at 5 a.m. CrossFit class or at SkinnyFit on Sunday mornings. 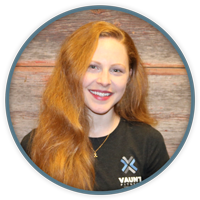 If you see me around Vaunt, don’t hesitate to seek me out for any tips or personal training, I am always happy to help you achieve your fitness goals.